Home Cycling CTC Rides Drivel Links Who am I? ... and what am I doing? 11/07/2006 Sweden Our planned ferry crossing over the Vanern should have gone without a hitch. The only problem was that the next ferry crossing wasn't due to leave for another 6 days. Needless to say we weren't too impressed by that! We had little choice than to retrace our steps back up the peninsular and cycle around the lake insead. That evening we consoled ourselves by a stay in a proper camp site, and even went kayaking the following morning. From there we continued our pedallings through the seemingly unending forest of Sweden. Unfortunately we have seen no moose, just plenty of mosquitos! We're nearing the coast now and will possibly be in Denmark tomorrow. No recent touring, I have been studying at university. Want to get in touch with Kitzy? but remember, if she's riding she won't be replying! So what do I use for these epics? 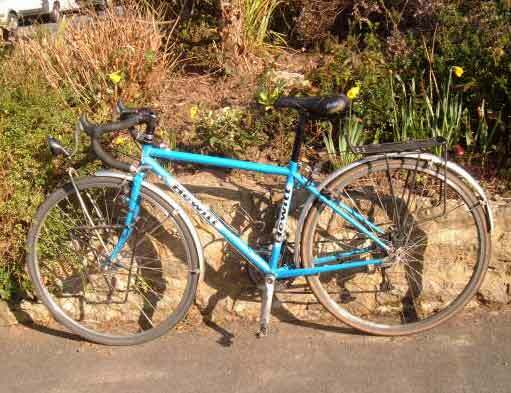 A Hewitt Cheviot frame with Deore XT and Dura Ace, made for me in Easter 2004 over 7000 touring miles so far, many more unladen, and thousands more to do! Easter 2004 Home from Lancashire. How/Why did you start cycle touring? As usual, blame the parents. I learnt to ride without stabilisers when I was 3, and went on my first European tour when I was 7, from St Malo to Bilbao. Though admittedly on a trailer bike! What have you been up to since then? I've been cycling ever since! 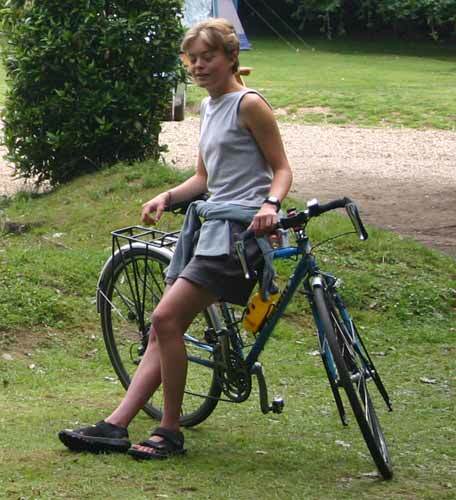 Several school holidays were spent cycle touring in the UK and Europe. For two years I rode to college and back (anything from 6 to 30 miles each way), and spent my weekends riding too. In February 2004 I planned my first mini-tour, and dragged Richard (Bomber Castle to you forummites) along too. After college finished I started my 15 month gap year and haven't really stopped since! How are you financing this gap year? I worked practically every Saturday for two years in my local Co-op. That alone would be enough to make anyone want to leave the country! Where do you sleep? I take my trusty Mountain Marathon tent and usually sleep in fields. It's always polite to ask the farmer first, and I often get invited in for dinner and a chat with the family...in whatever language they happen to speak. It's always good fun! What do you eat? As I mentioned above, it's not unusual for me to be given dinner, breakfast...and a packed lunch! In fact, in Italy at one point I was accruing food faster than I could eat it. Failing that, you can't go wrong with bread and fruit. How much does your bike weigh? A lot!!!! Doesn't touring alone worry you? Not really, most people just want to help, especially if you're by yourself. I'm usually far to excited about being in a place I've never been before to feel worried! Do you get homesick? Occasionally when I'm very tired I'll wish I didn't have to worry about where I was staying that night, or have to battle with a foreign language. However it's a rare occurance and I'm always feeling fine after some sleep! Do you get worn out? Unfortunately yes. I must remember to take rest days!